I have always enjoyed the creative arts; from graphic design to upholstery, and even restoring and adding on to my studio. My love of photography came to me through a required class while studying in the graphic arts field. I found myself totally fascinated in the darkroom, spending hours and hours enjoying the photographic process. When the digital age dawned, I embraced it with so much wide-eyed enthusiasm, I couldn’t get enough of it. I started out scanning my client’s negatives. Finally, cameras caught up, and when I got my first digital camera, it was magic! I have always felt it important to keep up with technology for my clients and have the best camera and lighting equipment to provide the best possible portraiture. My location/building provides a unique indoor and outdoor studio. 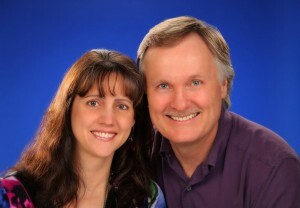 Our friendly staff includes Laurie my amazing wife, accountant, retoucher, confidant, etc; and myself. I do a little of everything when needed, but I’m mostly behind the camera.